Rapper/actor Chef Sean appeared back at his hometown recently which included a big show in Chicago promoted by several Chicago Bears. Chef Sean performed at "Industry Night" hosted by Rashaad Reynold with Chef Sean and Chicago Bears Markus Wheaton. Chef Sean expressed at Power 92 Radio, Seandale / Rawtv Radio on Sunday night, his love for his neighborhood and how when he's in town--he always likes to travel back to his community to not only visit family and friends, but to also share knowledge with some friends and fans who look up to him. Power 92.3 Chicago debuted Chef Sean’s newest single “Gone”. Chef Sean also loves to give back to his community while in town, so he participated in the Stop the Violence celebrity basketball game at Marshall High School. 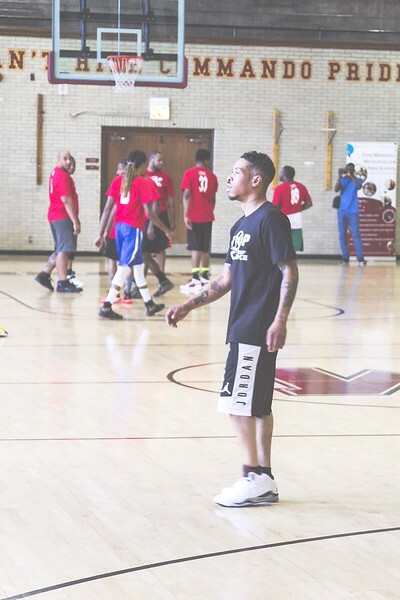 The celebrities gave away book bags for the kids in need at the school, followed by a basketball game featuring Twista's team Vs another local team. Chef Sean is not just an emerging rap star, he has been acting since he was 12, starring in Jason's Lyrics. He has also played significant parts in movies with Forest Whitaker and Jada Pinkett. To view footage from this promo tour and single drop please visit: https://www.youtube.com/watch?v=WsITsYa3RL or visit his website at http://therealchefsean.com.